There is a lot to consider when purchasing a diamond. You want to make sure that you are getting the most beautiful, high quality gem that your money can buy, but what do you need to know? In the end you shouldn’t get too “hung up” on optics, angles and scientific details. You should remember the old expression “beauty is in the eye of the beholder”. The question is, ultimately, do you think it’s a beautiful diamond? Does it take your breath away? Understanding the quality factors will help, but don’t worry, you don’t need to become a diamond expert. Particularly if it’s a larger diamond, it should be accompanied by a quality analysis report generated by a reputable gem lab, like the Gemological Institute of America (GIA). At the least, a qualified and experienced gemologist should analyze the diamond. Once we know the gem has been properly graded, the next question is, how do we look at the grading criteria and determine which stone is the best for us? Four criteria must be considered and need to be understood to buy intelligently. They are called the four C’s: Color, clarity, cut and carat weight. Buying a diamond requires developing a personal opinion of what constitutes beauty and, with your budget in mind, deciding which of the criteria you’re willing to sacrifice and to what extent. COLOR: Although diamond occurs in every color of the spectrum, when we think about the first “C”, relatively color-less stones come to mind. The commonly accepted scale used to describe these colors starts with “D”, the most colorless, and ends with “Z”, the most yellow, brown or gray. The GIA developed this scale in 1953. Previously existing systems had used grades such as A, AA, AAA, B and C. It was a confusing array of letters that had questionable meaning. Most people will be unable to see color in a diamond with a grade as low as “I” or “J”, particularly if it’s in a setting. If the setting is yellow gold, the diamond’s color will be even harder to detect. Fluorescence is a characteristic often associated with color. It is generally mentioned on “certificates”, next to the color grade. If a diamond is fluorescent, it “glows” when exposed to ultraviolet light, a component of sunlight. The most common fluorescent color is blue but other colors occur as well. Blue fluorescence has the potential to lessen the appearance of yellow-ness in a diamond, making it look better. Faint or medium blue fluorescence will not detract from the beauty or value of a diamond and might actually be considered a distinctive identifying feature. If blue fluorescence is strong or very strong, however, the diamond may, on rare occasions, appear “oily” or lose a bit of transparency, particularly when viewed outdoors. What size diamond would you like? What is the shape and facet arrangement of the gem? If the stone is well cut, and therefore more brilliant, the color grade may not need to be as high. If the stone is intended for an engagement ring, you may want to spend a little more and get a better color. If the diamond is less than .25 carats, it doesn’t show its color to the same extent, so a top color grade may be unnecessary. One needs to determine how colorless they would like their new diamond to be, relative to their budget. Some will opt for a colorless stone because of its great rarity and others will choose lower color grade diamonds because one or more of the other C’s is more important to them. There are many that will select a diamond with a color grade in the G to J range because they’re not the most expensive and yet, the average person will not see any color in the stone. There is no right or wrong answer. With a clear understanding of the nature of color in diamond, you simply need to decide what’s most important to you. Bezel-set stones with metal covering the entire edge of the diamond. With these things in mind, you might opt for a lower clarity grade stone than you would otherwise. Be aware, however, some inclusions are less desirable than others. Chips and surface-reaching fractures may actually undermine the durability of the gem. CUT: The third “C” is the most complicated. The cut grade is assigned after considering the geometry of the finished diamond and the care that was taken in polishing the facets, regardless of the stone’s shape (i.e. round, oval, pear, cushion, etc.) and facet arrangement. A well cut diamond returns as much light to the viewer’s eye as possible. This light could be seen as brilliance (white light), fire (colored light) or sparkle; hopefully a pleasing combination of the three. A complication arises when the following question is asked: “what combination of proportions and angles creates the ideal balance of brilliance, fire and sparkle?” There have been a variety of answers to that question. Many diamond cutters, scientists, gemologists and jewelers have offered their opinions and presented their evidence. As of yet, however, an “ideal” has not been universally agreed upon, particularly for shapes other than round. So where does that leave you? The laboratories that assign a cut grade, use terms to describe ranges of cut quality. GIA’s cut grading scale, for example, is as follows: Excellent, Very Good, Good, Fair and Poor (it is assigned for round stones only). After seeing a number of diamonds, you’ll realize that not every “excellent” cut diamond looks the same but every one should look more brilliant, fiery and/or sparkling than a “very good” or “good” cut grade diamond and you’ll develop an opinion of what type and pattern of light return you prefer. If you’re shopping for a round diamond, use these grades as a guide, but regardless of whether the diamond is round or not, consider the type and quality of light return. Do you think it’s attractive? CARAT WEIGHT: This is the only one of the 4-C’s that has nothing to do with quality. There are large, poor quality diamonds and small high quality diamonds. Carat weight, however, has everything to do with rarity. Big diamonds are harder to find than small ones, so they’re more expensive. What’s a carat, you ask? A carat is a unit of weight that equals a fifth of a gram. One carat is made up of 100 points. There’s an interesting phenomenon that relates to carat weight. The price for certain significant weights is higher than one might expect. The cost of a half carat (50 point) diamond, for example, is higher than a 49 point stone, all other factors being equal. The difference is more than one point would justify, however. The reason for the jump in price is the psychological significance of a half carat. 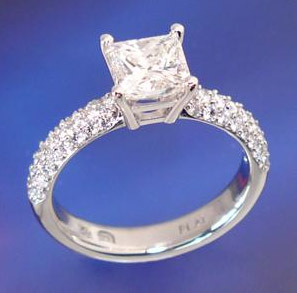 Other significant weights are one carat, a carat and a half and two carats. So, if you’re interested in buying a one carat diamond, you’ll save some money if you get a “98 pointer” instead. It will look like a one carat stone but no one will know it’s a couple of points shy. As you’re shopping around, decide which of the 4-C’s is most important to you. Although you may not consider yourself a diamond expert, you now know what makes one diamond more or less desirable than another and you know what you’re willing to spend. Make sure that you allow your own personal sense of beauty to guide you in selecting your perfect diamond. Whether for insuring your valuable possessions, providing an equitable distribution of property to your heirs or maximizing your investments at market peaks, an unbiased opinion of value by a certified appraiser limits risk and provides for confident decision-making and personal peace-of-mind.